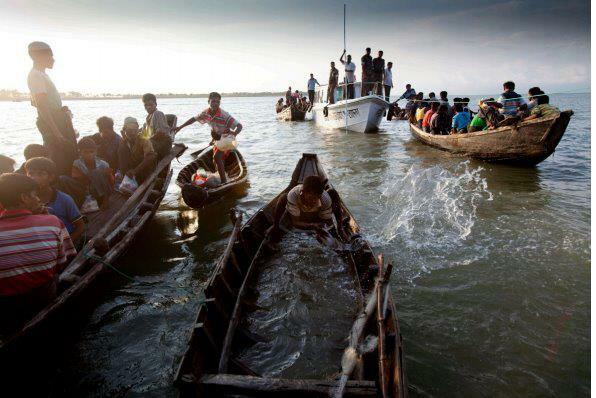 A boat carrying about 200 Rohingya Muslims has capsized off western Burma, aid agencies say. The boat was evacuating people ahead of Cyclone Mahasen, which is expected to hit the area later in the week. It sank off Pauktaw township in Rakhine state late on Monday, leaving an unknown number of people missing. Tens of thousands of Rohingya Muslims are living in temporary camps in Rakhine after violence last year. The UN had called for an urgent evacuation ahead of the storm, warning that many areas where displaced people are now living are in low-lying coastal areas at risk of flooding or tidal surges. Aid agencies said that three boats carrying between 100 and 200 people got into trouble after setting out on Monday night. At least one boat, which was towing the other two smaller boats, sank, and dozens of people are still missing. Barbara Manzi, head of the UN Office for the Coordination of Humanitarian Affairs (UNOCHA), said the search-and-rescue operations were ongoing. “It appears that this boat left the camp with the blessing of the authorities before hitting rocks,” she said. Burmese officials began evacuations this week, after warnings the cyclone may hit neighboring Bangladesh from Thursday, bringing heavy rain and flooding to western Burma. This could hit an estimated 140,000 displaced people – mostly Rohingya – who are living in makeshift shelters in Rakhine, aid groups say. They have been displaced since violent clashes between Rakhine’s Muslim and Buddhist communities in June and October 2012. “The government has been repeatedly warned to make appropriate arrangements for those displaced in Rakhine state,” Isabelle Arradon, deputy Asia Pacific director of the rights group Amnesty International, said in a statement on Monday. Brad Adams, Asia director at Human Rights Watch, said that if the government failed to evacuate those at risk, “any disaster that results will not be natural but man-made”. But some people have reportedly refused to leave because they fear having nowhere else to go. “We are very worried about the cyclone… we do not have enough food to eat,” a member of the Rohingya community told Agence-France Presse news agency. According to NASA, Cyclone Mahasen was north-east of Sri Lanka on Monday. It was expected to strengthen as it moved north, the agency said.